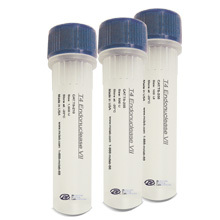 For DNA sequencing high GC regions and rapid sequencing from nanogram amounts of DNA templates. A recombinant E. coli strain carrying the BST DNA Polymerase gene (large fragment). Figure: MCLAB Bst DNA Polymerase (large fragment) shows higher strand -displacing polymerase activity than two other vendors' products. Bst DNA Polymerase (large fragment) is a portion of Bacillus stearothermophilus DNA Polymerase protein that contains 5´-> 3´ polymerase activity, but lacks 5'->3' and 3'->5' exonuclease activities. 1. Does Bst DNA Polymerase have a 3'->5' proofreading exonuclease activity? 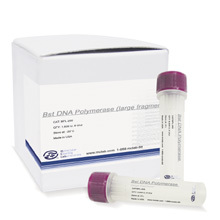 2.What is the difference between Bst DNA Polymerase (regular) and Bst DNA Polymerase, large fragment? 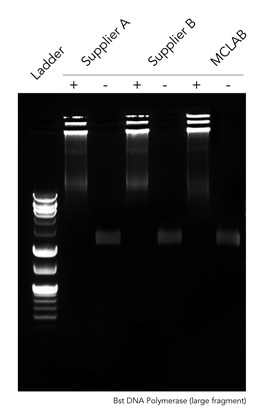 Bst DNA Polymerase, large fragment does not have the N-terminal exonuclease domain, so it not only lacks 3'->5' exonuclease activity, it also lacks 5'->3' exonuclease activity. 3. 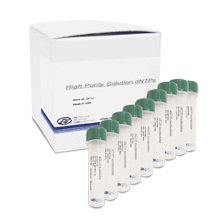 What is the best temperature range for Bst DNA Polymerase to be used? 4. 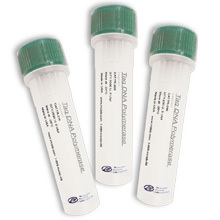 What are the benefits of choosing Bst DNA Polymerase? Bst DNA Polymerase, either regular or large fragment, is good at strand displacement with optimal temperature of 60-65°. This gives researchers a wider range of reaction conditions to optimize strand displacement and primer annealing. This is useful in the design of sequencing strategies as well as isothermal amplification technologies. 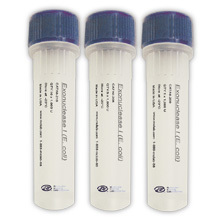 The elevated reaction temperature facilitates sequencing through GC rich regions. 5. Can Bst DNA Polymerase be used for thermal cycle sequencing? No, the reaction temperatures are too high for enzyme stability. It becomes inactive at 80°C for 10 minutes.